This book is for those who are fascinated by Lake Superior and its surroundings. I find those places utterly captivating and endlessly educational. That is why after decades of looking and listening, I’m still discovering them. Tom Warren – Lake SuperiorFor almost forty years my family has had a home away from home on the big lake in the Western Upper Peninsula of Michigan. Unlike natives of the UP, we don’t call our place a camp. We don’t talk with the accent that characterizes many locals, and our names aren’t Finnish. Our license plates say Wisconsin. We pay local property taxes, but have no political clout or aspiration for elected office. We are five miles from the closest community of Ontonagon, but distant in other ways as well. Some might call us summer people, but that designation is incomplete. I like to think of us as curious sojourners. Guests in a setting that makes us welcome. The hosts are wonderful. Neighbors, merchants, carpenters, artists, and countless strangers help us out of jams, tend to our ailments and emergencies, fix our stuff, look after things when we are away, and make us feel at home. They built and rebuilt our cabin. They keep our plumbing from freezing. They sell us what we need. They describe winters that we otherwise would learn about only from precipitation tables or weather reports of the Ontonagon Herald which is delivered each week to our home in southern Wisconsin. They tell us about their favorite trails to hike in the Porcupine Mountains Wilderness State Park to the west and their favorite places to canoe nearby and in the Sylvania Wilderness and Recreation Area to the south. In many ways and via different styles local people teach us and we are thankful for it, but the land and the lake are our main inspirations. These natural teachers sharpen our eyes and allow us to see the world more clearly. They open our other senses to things that we could miss. They make us appreciate what we have as well as what is lost and fragile. Perhaps over time the land and lake give us insights that come early to true Yoopers. During a given year, I am away from our Lake Superior property much of the time and wonder what could be happening up there. These apprehensions sometimes show up in dreams that always represent the land and the lake as less attractive than they really are. For example, treasured natural resources appear vulnerable in my dreams and our cabin is falling apart or being invaded by creatures of all sizes. Particular details fade away quickly after waking up, but the persistent message is this: Lake Superior and the land have taken on an important place in my life even when I am not there. If I don’t think about them enough during my waking hours, subconscious forces that operate through dreams will not let me forget this fact: Lake Superior and the land are a part of me. I must give them their due consideration. Lake Superior shoresThe chapters that follow draw heavily from many years of journal writing while at the lake. I am also the beneficiary of reverberations from the voices of others who have shared their impressions in words, sounds, or images. Sigurd Olson has had an especially strong influence through his books. I still write in my journal during each visit. They describe another day on the edge of the lake along with occasional references to simultaneous events in the outside world. Previous intrusions from afar have included: An earthquake hitting San Francisco while I am listening to the World Series. Princess Diana dying in a car accident. “Nine/Eleven” becoming another day of infamy. Flood waters seeping into our daughter’s home. Gas costing $4.24 a gallon … and so on. Thank goodness most of the recorded events are uplifting ones: Our newborn grandchild is doing fine. An eagle flew by. What a sunset! The new trees we planted are exploding with growth. We hiked the Little Carp River Trail. No flies! All profits from the sale of the book go to support Friends of the Porcupine Mountains Wilderness State Park. The sand beach intrigued me more than ever this trip. On Wednesday it was narrow but very thick. On Thursday morning a dramatic deposit of fresh sand was working its way eastward. By 9:30 our neighbor’s beach was as wide as I have ever seen it, and moving our way. (I had to leave for the south before I could see the full effect.) J1: 34. The animals I have crossed paths with since 1970 in the UP are big & small, wild & domestic, friendly & elusive, plentiful & endangered. The probability of seeing them has changed over time. I see more eagles, deer, bear, cranes, and turkeys but fewer otters, swallows, loons, partridge, and yes, biting flies. Jottings like these have accumulated over the decades and become raw material for reflecting on Lake Superior and the UP. So you think you know all about Lake Superior? 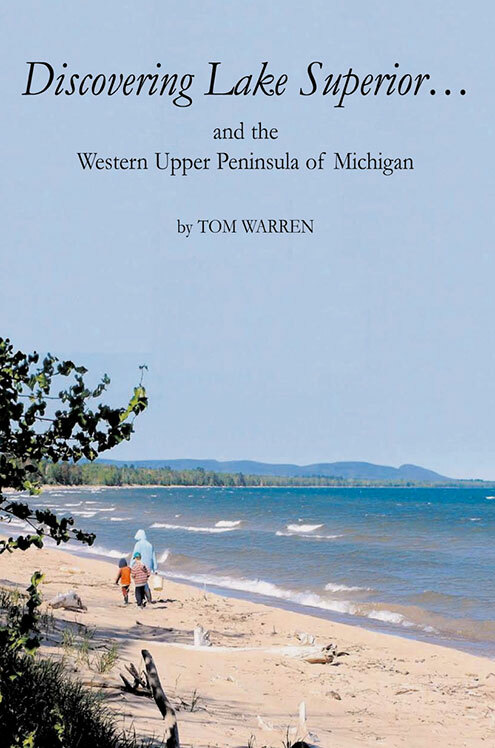 Well, here is a new book by Dr. Tom Warren, a seasonal resident of our Ontonagon area who came to know the lake through actual hands-on-contact. Tom and Mim Warren, who have their winter residence in Beloit, Wisconsin, have been coming to the Ontonagon area for the last 40 years. [In this book] you will learn things about the BIG Lake that you have taken for granted for years and possibly never gave much thought to. You will [want to] get a first edition copy of what is sure to become a collector’s classic. What a delight…to pick up Discovering Lake Superior, open to a page at random, and read! Whatever I happen upon triggers a smile, and I hear Tom’s voice, and he has me hooked. He has beautifully told the story of this north country, a mostly wild gem of water and woods. [Discovering Lake Superior] has the kind of scientific dimension you might expect from a professor, full of tidbits about weather, geology, lake depths, trees and vegetation, and always shining through is an insatiable sense of curiosity — about everything…The tone of the book, however, is one of awe and inspiration and a deep longing for what today’s society with all of its modernity seems to have lost: a primal connection to nature. [Warren’s] obvious appreciation for the beauty around him is never ending in his writings. In Discovering Lake Superior Tom Warren writes, “If the unabridged story of the Porcupine Mountains were a chronologically ordered thousand page book, with each page representing a million years, Lake Superior would first appear on the last page, at the bottom.” Here is where Tom is at his best, taking the measure of time and change. The wilderness is slowly returning as the human population of this lonely and remote area ebbs, done in by decades of a flagging economy. Wolves, cougars and moose, long absent from the scene, are moving back in as people move out. Still, this vast and remote land, once the Northern Frontier of the United States, is a jewel waiting to be discovered by newcomers and rediscovered by Yoopers who appreciate and sustain a Lake Superior treasure. So is this book.